The city’s housing crisis in Queens is falling heavier on immigrants than any other population, but the legalization of basement apartments could be the solution, advocates argue. The growing cost of living in New York City has made affordable housing a challenge for immigrants. Seeing the dire need of affordable housing and an outpour of low socioeconomic immigrants renting illegal basement units, Chhaya started a campaign to push for basement apartment legalization in New York City. Since the campaign’s initial launch three years ago, Mayor Bill de Blasio and organizations such as Pratt Center for Community Development and Queens Legal Services, have joined the campaign in support of easing the housing issues immigrants face in New York City. In June of this year, the Mayor launched a pilot Basement Conversion Program to “support homeowners in creating safe, legal basement apartments that will improve their financial stability, while generating new, quality housing for tenants,” said Commissioner Maria Torres-Springer in a press release at the time. Basement legalization intends to provide tenants living in basements with the same rights as those living in any other apartment unit. “Most basement units are neglected by the owner of the property because they are an illegal unit which means the tenant living there does not have actual rights. Tenants can’t call 311 to report an issue and landlords can spike up their rent with little to no notice,” says Spisak. 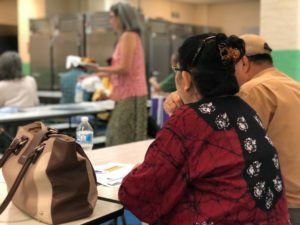 South Asian tenant attends a Renter’s Rights Workshop lead by Chhaya in Jackson Heights. According to a study by Chhaya CDC and the Pratt Center for Community Development in 2008, the last time data is available, it was estimated that between 300,000 to 500,000 New Yorkers were residing in illegal basement units. Earlier this year, Lieutenant Mike Davidson lost his life while extinguishing a fire in a basement in Harlem. Advocates argue that basement legalization will allow for existing basement apartments to transition into safe facilities. “People are already living in illegal basement apartments, at least recognizing them as legal will make it safe for those living in them,” says Spisak. Despite the risks, the reality is that tenants are not the only ones who seek basement apartments because of the city’s lack of affordable housing. Homeowners do too. “Renting out my basement is an additional source of income which helps me pay my mortgage every month,” says Shakeela Sultana who has been renting out the basement apartment of her house in Richmond Hill for 20 years. Sabena Chaudhry is an aspiring documentary filmmaker and journalist. As a first-generation Pakistani-American, born and raised in New York City, both the experience of navigating different cultures and the diversity of the city itself has inspired and led her to pursue journalism to further explore the stories of immigrant communities, grassroots organizing and gender based violence.